First of all you must have a PC running Windows Xp or Windows 7 and Android Software Development kit (SDK) for the required file Know as Android Debug Bridge (ADB) it is a executable file. But if you have not installed Android SDK which includes ADB on your PC, then for instruction follow this guide. Make Backup of important files and data that are stored on your phone before proceeding. 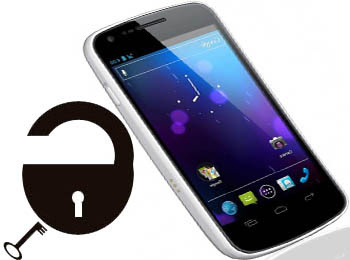 This Instructional guide is only for Galaxy Nexus And not for any other Devices So don't try to use it with other phone .Bootloader unlocking may void warranty of your phone. Use at your own risk, we will not be held responsible if you damage, brick or what ever happens to your phone while unlocking your phone. First of all you will have to update your pc with latest driver required to connect your nexus. You can download Driver from here for your Galaxy Nexus. Now enable USB debugging on your phone by going to menu >> Settings >> Development >>USB Debugging. Now Connect your Galaxy nexus phone to PC with the help of USB cable. Now open Command Prompt and go to the directory where you placed fastboot.exe and adb.exe either this /tools or /platform-tools folder or simply from windows navigate into the folder either this /tools or /platform-tools and press and hold the Shift key, then right-click on the the blank Space and from the menu that appears select "OPEN CAMMAMD WINDOW HERE" and a command prompt window will appear. Type this “adb reboot bootloader” command without Quotes in the command prompt and press enter the phone will reboot in bootloader mode. As now your phone is in bootloader mode type this “fastboot oem unlock” command in command prompt and press enter. Now your phone will ask for your confirmation whether to unlock your phone Bootloader or not .Now for navigation use volume keys and for selection use Power button. To unlock the bootloader select yes option and conform using selection key. The bootloader of your phone has been successfully unlocked. In case you get interrupted in the mid of the process you will have to repeated the process from beginning but before that clear cache using recovery mode. Next is how to Root your Galaxy nexus.